We understand how hard it is to let parents and community members know what a great job your school is doing. You already have so much to do and now must market your school and let people know what all your school has to offer. Marketing and public relations is a complex and challenging responsibility. Well, now we can help! 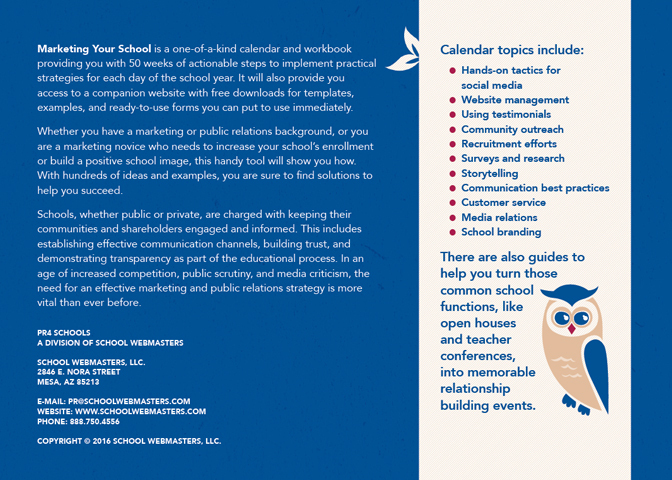 Buy your Marketing Calendar Toolkit Today! A year's worth of marketing strategies at your fingertips. 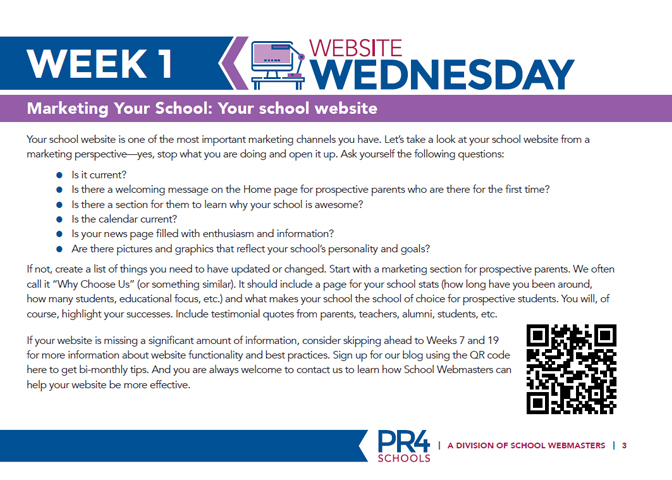 Now anyone can take their school marketing to the next level! 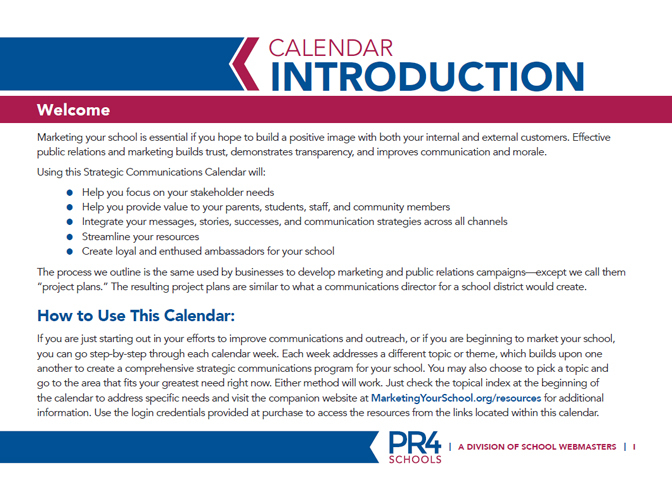 Get your Marketing Your School Calendar filled with marketing tips and guidelines for every day of the school year in one handy reference. It is 250 pages of detailed marketing steps, plus you’ll receive a login to our secured companion website with support materials, templates, forms, references, surveys, project plans, and much more. 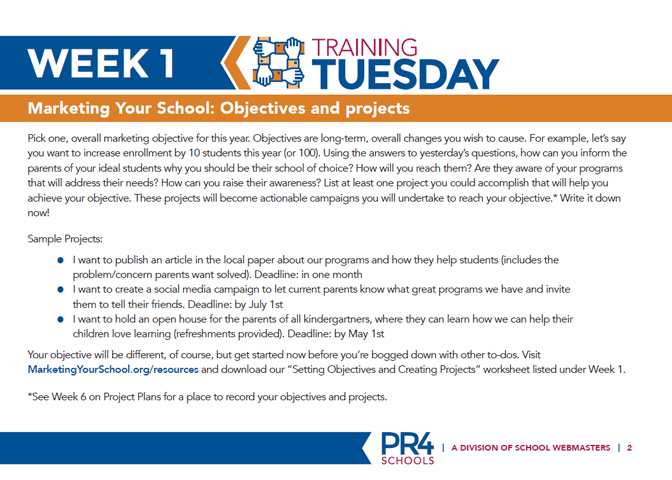 The Marketing Your School calendar/workbook is like a year-long school marketing and public relations course that you take at your own pace. It is used by school principals, school superintendents, school secretaries, communications coordinators, public relations specialists and anyone who cares about improving school public relations and communications. Much more than the typical marketing textbook, this marketing toolkit contains 50 weeks of practical marketing strategies. 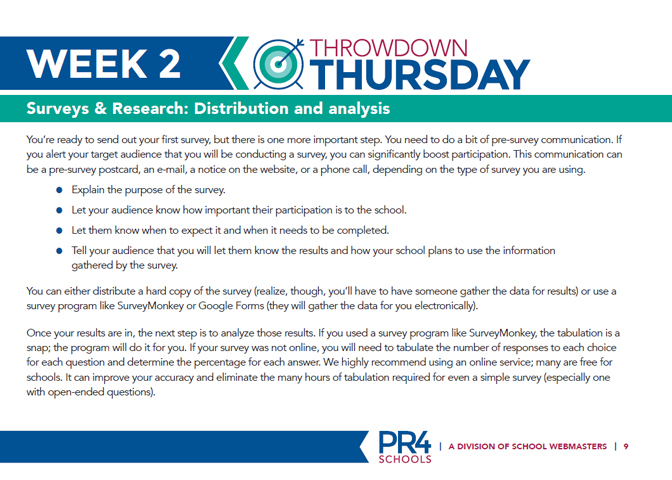 You can either select what will work best for your school by selecting the appropriate topic or theme or you can work your way through the weeks in order, day by day. Either way, you will see tremendous strides in improved school marketing and communications, better branding and reputation, and more engaged parents. Keep it up for a full year and you’ll see parents, students, and community members who are enthused advocates and happily doing word-of-mouth marketing for you. You'll never be able to do it all in one year, but you'll have ideas and recommendations for years to come. 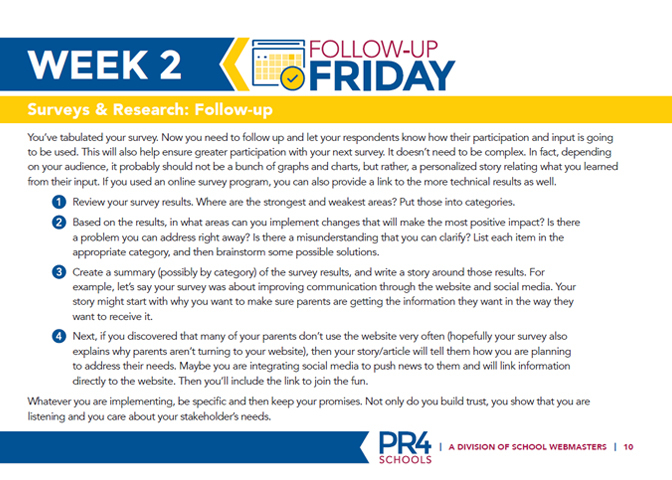 If you decide you don't have the staff to help you implement all the great marketing ideas included, let us know and we'll show you our PR4 Schools services where we put someone on the ground at your school to help you put marketing strategies into practice. There are also guides to help you turn common school functions, like that open house and your teacher conferences, into memorable relationship building events. 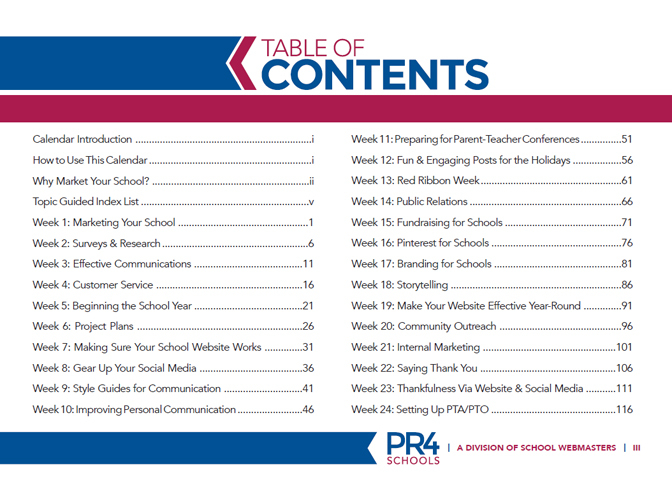 Get hundreds of ideas in a desktop strategic communication plan that will serve your school for years to come. 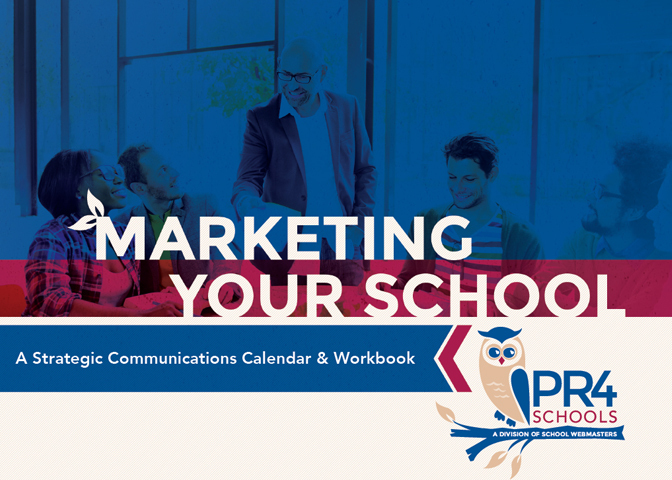 This yearlong marketing calendar will help you become the school of choice, step-by-step. 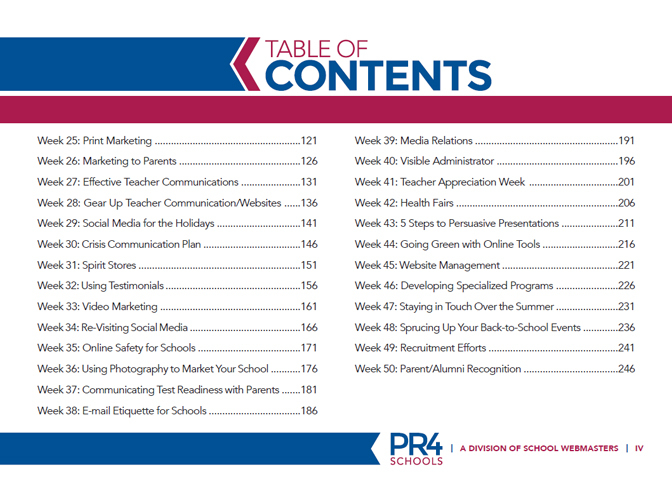 For only $279 you get more than a year's worth of marketing strategy that can be implemented by anyone from a school principal or a secretary to the school's communication director.